Former President George H.W. 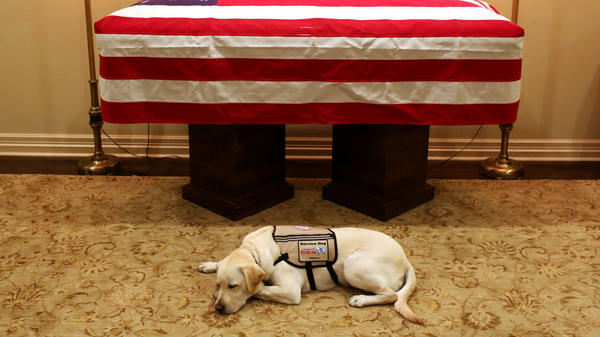 Bush's service dog lies in front of his casket in Houston on Sunday. The 41st president died Friday at the age of 94. Sully, the service dog of former President George H.W. Bush, spent Sunday night lying before Bush's flag-draped casket in Houston. Jim McGrath, spokesman for the Bush family, tweeted out a photo on Sunday night, captioning it "mission complete." Jeb Bush retweeted the image, adding "Sully has the watch." CNN reported that Sully would travel with the casket to Washington, D.C., where several days of remembrance ceremonies are being held. Sully, a 2-year-old yellow Labrador retriever, is named after the pilot Chesley "Sully" Sullenberger III, who on Jan. 15, 2009, landed a passenger plane in the Hudson River after hitting a flock of geese. He was portrayed by Tom Hanks in a movie about the incident. Sully became the late president's service dog in June, a couple of months after former first lady Barbara Bush died. The yellow Lab was trained by America's VetDogs, which places service dogs and guide dogs with veterans, active-duty service members and first responders. Bush had a form of Parkinson's disease that caused slow movements and difficulty balancing, among other symptoms. He frequently used a wheelchair toward the end of his life, and Sully provided assistance with daily life. "Sully could open doors, pick up items and summon help," The Associated Press reported. According to Sully's Instagram account, he also spent a lot of time frolicking on the beach and playing fetch. After Bush's funeral ceremonies are over, Sully will join the facility dog program at the Walter Reed National Military Medical Center in Bethesda, Md., reported TV station KTRK in Houston. There, he will help wounded veterans and service members during their recovery. George H.W. Bush and Barbara Bush were noted dog lovers. During their time in the White House, the presidential pets were Millie, a springer spaniel, and later one of Millie's puppies, named Ranger. Millie was famously referenced during the 1992 presidential campaign, when Bush said, of Bill Clinton and Al Gore, "My dog Millie knows more about foreign affairs than these two bozos."